I love antique books, a love inherited from my father who over decades has collected an eclectic range of extraordinary old books. I love their beauty, the stories they contain, and the sense of holding something that is a direct link to people in the past, not just authors and publishers, but also readers, who over the generations or even centuries have held them in their hands. And I also love the unexpected unofficial glimpses these books can give into those very same previous readers and owners, everything from old clippings, tickets, menus, dried flowers and other such things you can find tucked into the pages, to inscriptions, bookplates and scribbles left by previous readers/owners. The first is a 1786 edition of one of the volumes of the very famous Cabinet des fées compendium, which in 41 volumes gathered the fairy tales written by (mostly) French writers of the l17th and 18th centuries, such as Charles Perrault, Madame d’Aulnoy, Mme Leprince de Beaumont, Mademoiselle de la Force, and many others. This particular volume, number 37, is of great interest to anyone interested in the area(as I am!) 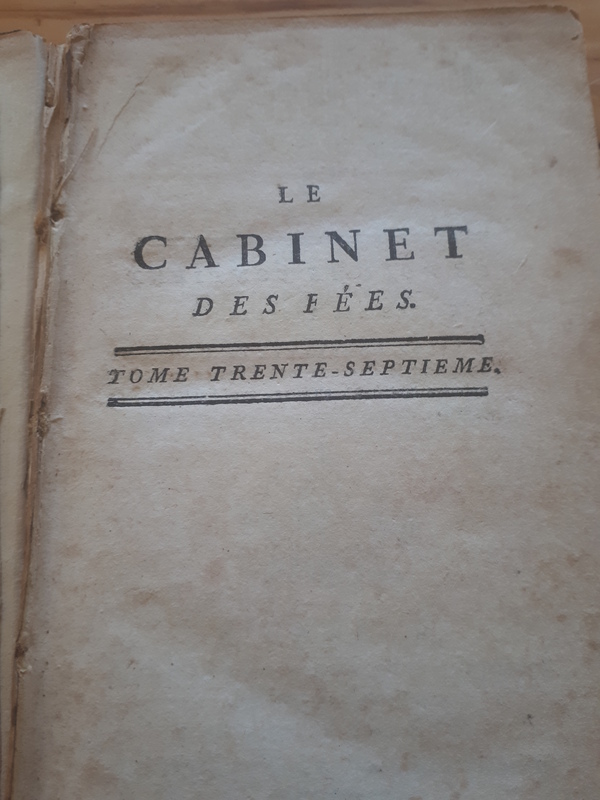 as it’s an index of the authors with full notes about their lives and works plus an introduction to the fairytale genre as it was written at the time and a list of all the other volumes in the Cabinet des fées. It’s fascinating in itself, of course, but where an old copy of this parts company with say, a new edition of the same work, is that traces of previous owners remain it it. 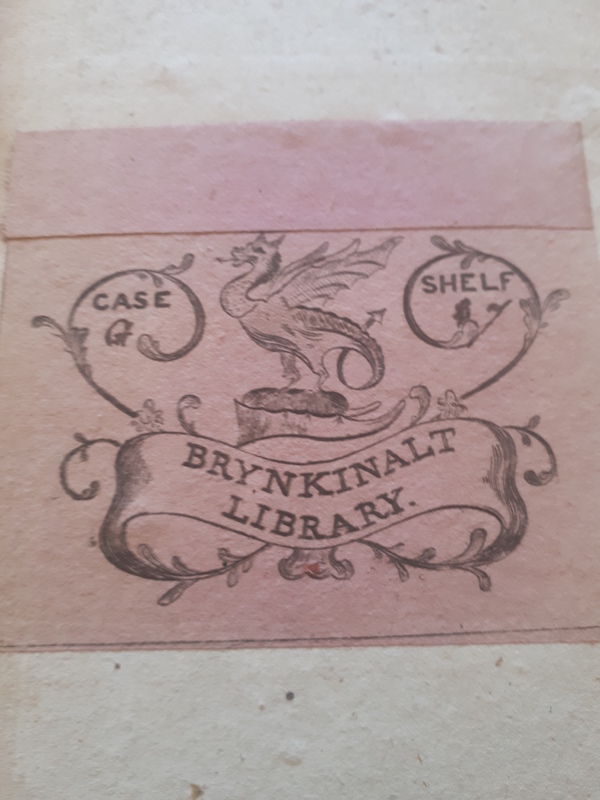 In this case, they are two bookplates: the first of which, pasted on the inside cover of the book, proclaims the book to be from ‘Case G, Shelf…(unreadable number, perhaps ‘2’) of ‘Brynkinalt Library’. 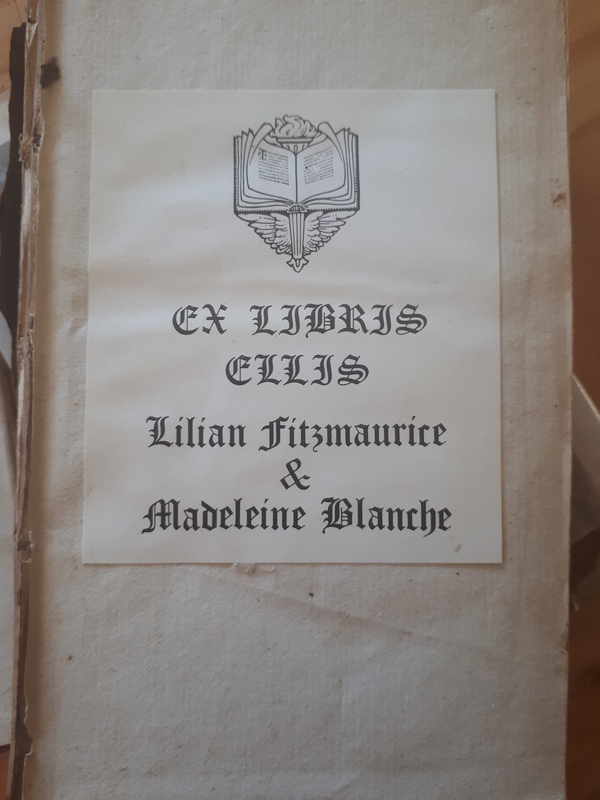 The second bookplate, pasted on the second internal page, just before the title page, informs us that that it is ‘Ex Libris Ellis’ (from the Ellis Library, or Library of the Ellis family) with two women’s names underneath: Lilian Fitzmaurice and Madeleine Blanche. A couple of searches on Google revealed to me something about the people behind the plates. The library name and the dragon symbol on the frst bookplate had made me pretty sure it had come from somewhere in Wales and so it proved to be but intriguingly, the Brynkinalt Library was not a public library, but a private one once housed on an estate that has belonged to the one family since the 10th century. Could the eighteenth-century faces that stare out at the viewer from the painting featured on the Brynkinalt website have once been bent over this book? 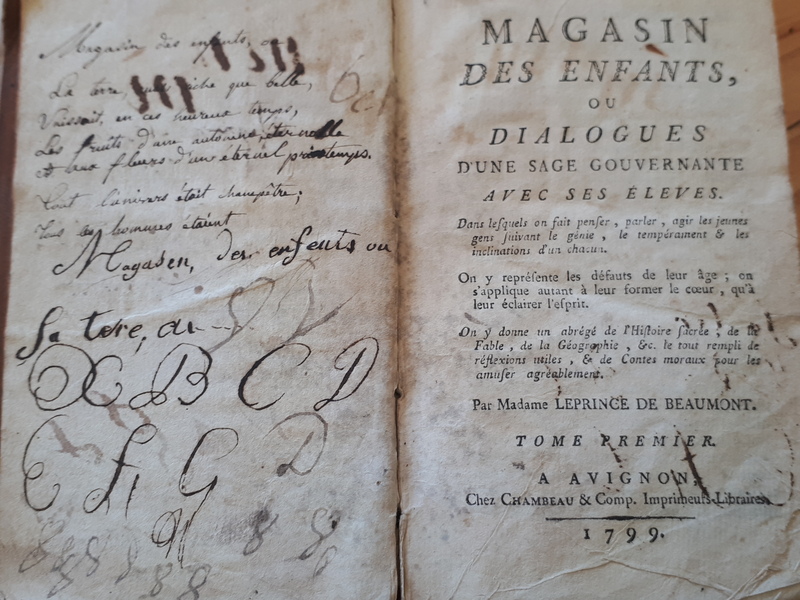 Investigating the second bookplate also produced an interesting result: the book had once belonged(presumably after it had left Brynkinalt library) to a renowned Canadian scholar in French literary studies and art history, Dr Madeleine Blanche Ellis of Montreal (1915-2008). The bookplate also cited Lililan Fitzmaurice, who turns out to be Dr Ellis’ mother (Lilian’s husband and Madeleine’s father was George Porter Ellis). 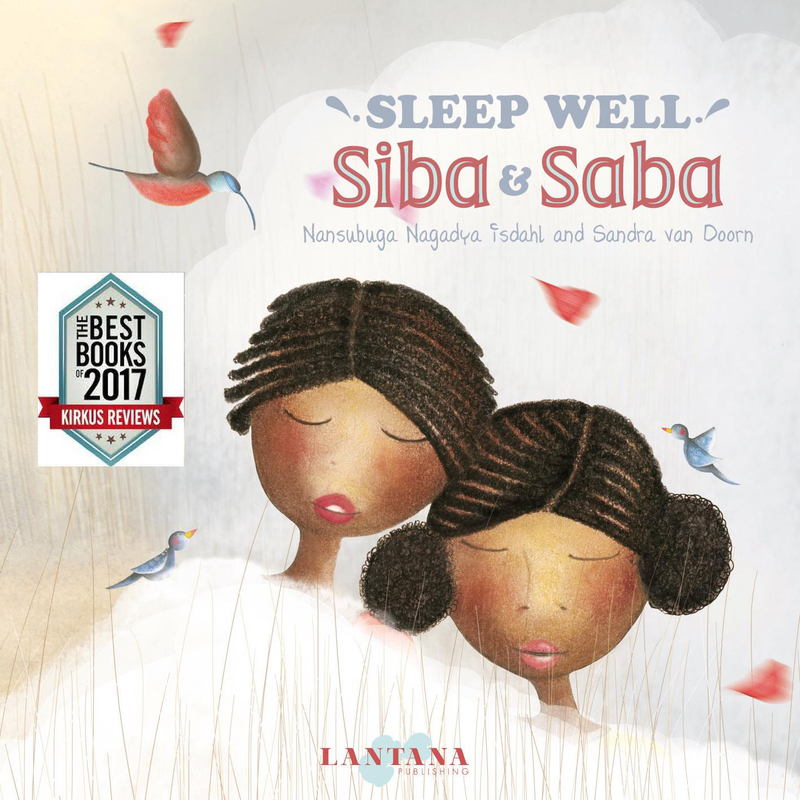 Mother and daughter are mentioned together on the bookplate, and the book comes from the library of the Ellis family. 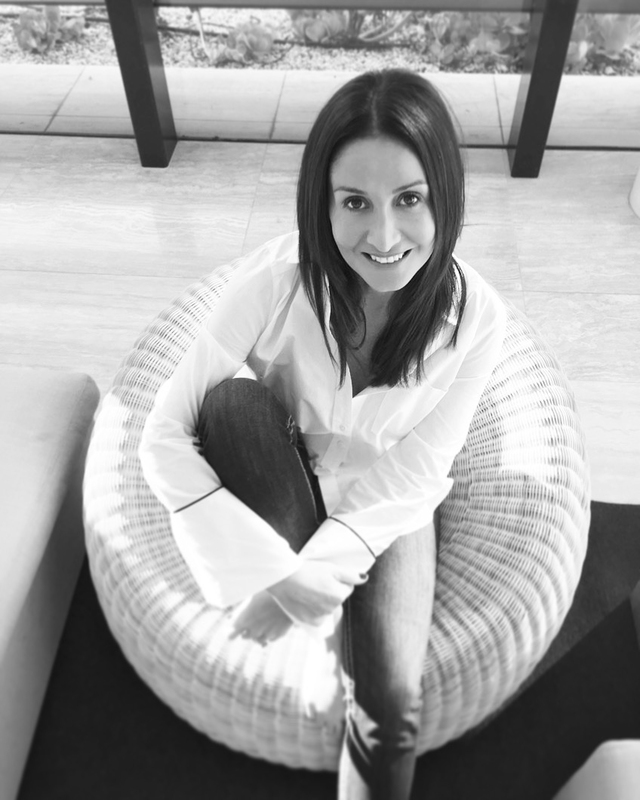 Was Madeleine still living at home at the time? Or did they own the book together? 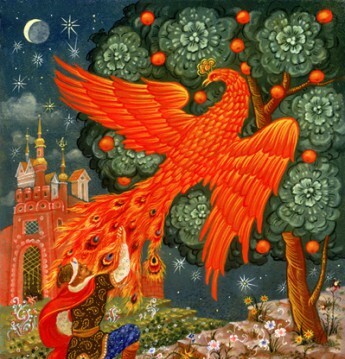 Small mysteries perhaps; but intriguing glimpses, as well, into past lives. The second book in my collection that offers an intriguing glimpse into past lives through unofficial additions to it is another book from the 18th century, also within the fairytale genre; a 1799 edition of the first volume of Madame Leprince de Beaumont’s Magasin des Enfants (first published in 1756) which contains within it her famous retelling of la Belle et la Bête, or Beauty and the Beast. 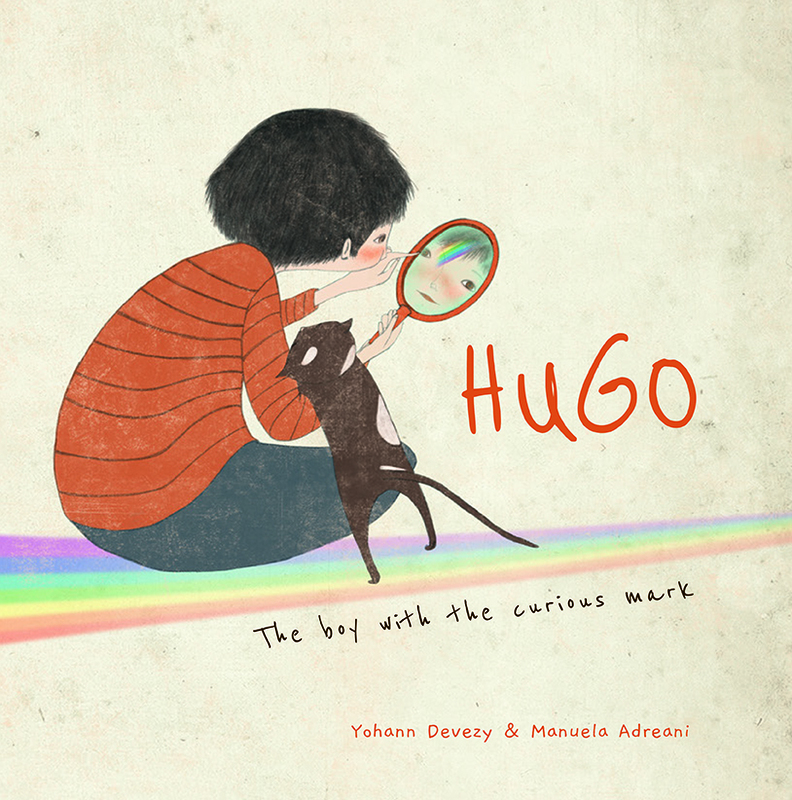 It’s a fascinating book of course, and there’s a lot to say about the tale itself and how it differs(very positively!) from an earlier version by an earlier fairytale-writer, Madame de Villeneuve, but that’s a story for another day. Today, what I want to note are those unofficial, marginal evocations of a previous reader’s relationship with this particular copy of the book. And it’s a very different story to the other one! 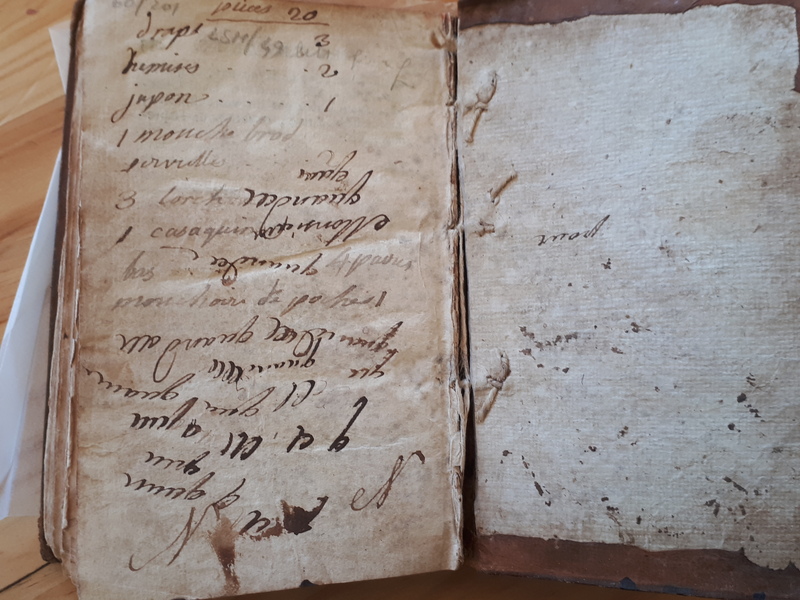 This reader, whoever he or she was (or else, and more likely, it was more than one person), clearly saw in the book an opportunity to practise hand-writing skills as well as a handy notebook for daily tasks. There is no defacing of the actual text of the book, only the flyleaves, front and back, and the title pages. 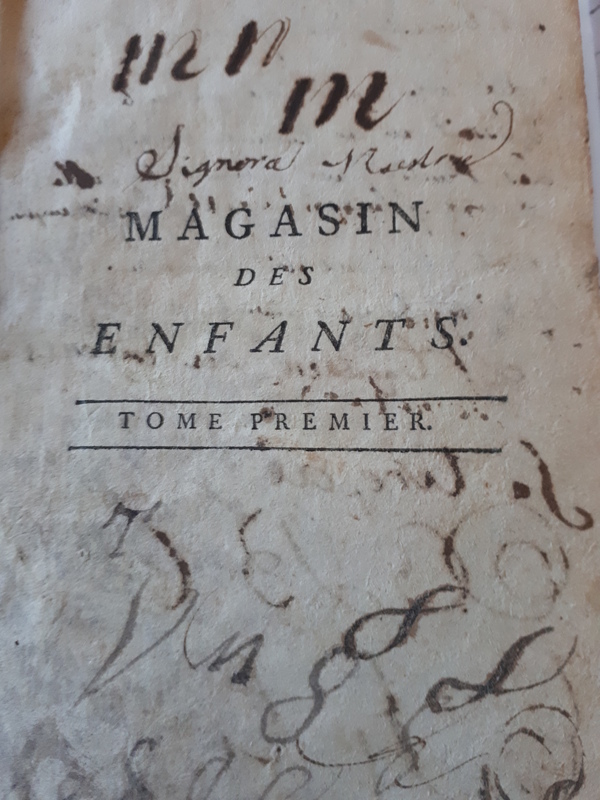 On the front flyleaf and title pages are flourishes in sepia ink of letters, words and sentences, mostly in French, but the half-title page has these words in Italian as well: ‘Signora Maestra’, which I believe means ‘Madam Teacher’. The back flyleaf meanwhile told a different tale. There are some ‘handwriting practice’ scribbles on it but also something quite different: an actual laundy list 🙂 ‘Twenty pieces’ proclaims the heading, which then goes on to list the various articles: draps(sheets) a jupon(petticoat), mouchoirs de poche(pocket handkerchieves), torchons(teatowels) and more. ‘Twenty pieces’ proclaims the heading. The words are in French, in a different, firmer hand to the other, and hints at an adult rather than a child or adolescent. Was it the laundrymaid who wrote those words, or more likely the lady of the house, or perhaps a housekeeper, noting down the articles that had been sent off to the laundry? I don’t know, anymore than I know why you’d use a book as a makeshift aide-memoire, and just once too(the kid scribbling in the book seems more understandable)but here again are glimpses of people from the past, anonymous but whose presences flicker into view, even if briefly, in a rather touching way.